Leeds based punkster trio Dead Naked Hippies have truly established themselves for their uninhibitedly thrashing live shows since first bursting onto the scene in 2016. The darkly brooding and fiery vocals of enigmatic lead singer Lucy Jowett, alongside imposingly fierce riffs and hard-hitting rhythms will shake up the Green Room in Stockton good and proper. Reinforcement on the punk-rock front comes from Casual Threats, Newcastle’s most unpredictable chaps who’s recent performance at Evolution Emerging still has us shaking in our boots. What’s more, pop-rockers Salsola will ease you into the night with guitar driven melodies and catchy hooks. Because the summer simply can’t feature enough festivals, here is another chance to experience a full days worth of live music in the form of NARC magazine’s very own NARC FEST 2018. Expect a wide spectrum of musical genres from up and coming acts across 8 stages in the Ouseburn valley including The Cluny, Little Buildings, Cumberland Arms and many more. If you’re inclined by electronica, Endless Window take over the Tanners Arms with a packed line-up headed up by our favourite synth-pop band Twist Helix whilst down at the Tyne Bar things are going to get rather rowdy with a heavy rock laden line-up, topped by the untameable Avalanche Party. But there is so much more to see including highly tipped acts like Penguin, Nano Kino, Behold A Pale Horse, No Teeth and Idle Hands – all of which will make this event an absolute must for any music lover. And did we mention it’s absolutely free?! Here at Spotlight Music UK we always aim to bring you the very best new local talent but this time we’ve gone beyond the realms of music. Joining forces with brand new feminist inspired clothing brand Catcall we are throwing a fabulous launch party at Newcastle’s Head of Steam that combines fashion and live music. Besides giving you the chance for a first glimpse of the brand’s upcoming products and purchase them at a discounted price, there will be performances from three exceedingly talented local acts: Indie dreamboats Deep.Sleep, melodic synth-duo Human X and harmonic acoustic two-piece Komparrison. So come join us and celebrate this highly promising new venture while grooving the night away! Newcastle’s experimental chaos-rockers Swine Tax have been busy conjuring up new material and are excited to let fans get a first listen live, and what better way to present it than in the only we expect from this crazy trio: thrashing and rocking out in front of a captivated crowd. And if their recently released track ‘Tory Water’ is anything to go by, we think these lads are about to blow our minds with even more valiantly punchy lyrics as well as furious guitar and drum rhythms alongside plenty of other clever wizardry that Swine Tax tend to throw into their sound. Support comes from three equally rocking bands you won’t want to miss: post-punk band Roxy Girls, mash-up garage-rockers No Nothings! from Hull and sublime lo-fi legends Japanese TV Club from Sunderland. Post-punk band Okay Champ are throwing a self-proclaimed “miserable party”, but we think this show at the intimate and cosy Cluny 2 will be anything but miserable as despite their gloomy grunge vibes we expect some pretty frantic scenes. Adding to the boisterous party mood are ear-busting girl-punksters Blom and mutant rockers Akne who are making a worthwhile journey all the way from Leeds. Earplugs highly recommended for this crazy night of unpretentiously assaulting live music. Currently promoting their self-released single ‘Find Me’, London trio I Am Aquitaine are set to leave a lasting mark on Newcastle with their formidable live show. Their sound combines futuristic psychedelic pop and hooking choruses that are positively glistening thanks to lead singer Elle Robert’s sublime vocals. No strangers to playing for large audiences at festivals, as well as supporting acts like Alabama 3, there is no doubt these guys will be the absolute crowd-pleasers of the night. But expect no less of an offering from two equally thrilling local support acts: the unassumingly wild rockers O’Captain, My Captain and quickly rising noir-rockers Ghost Signals whose hooking punk tunes are guaranteed to promptly latch themselves into your brain. Northern Electric Festival is back for its third year and ready once again to take over Ouseburn Valley’s prime music venues with a line-up that will have any electronica lover’s heart beating in the melodic rhythm of anticipation. Striving to showcase the thrilling and diverse sounds of electronic music and its influences on countless other genres to hard-core fans and curious revellers alike, the two day festival features performances from acts like Ceiling Demons, Key Greyson, Shamu, NALA, Behold a Pale Horse, Jennifer Walton, Me Lost Me and many more. So grab your glow sticks and join this fantastic celebration of synthetic music originating from right here in the North East. Promoters and lovers of the dark realms of music Noircastle present another night of spine-chilling performances by bringing some of the best darkly-inspired acts from the North East and beyond. In this latest edition Newcastle’s The Globe will welcome eighties veterans Trouble Fait all the way from France to bring us their darkwave punk sounds. Support comes from local gothic post-punk duo Lost on Me who are quickly making a name for themselves with their fearsomely gravelling vocals and brooding rock melodies. A night that welcomes music lovers of all shapes and sizes and lets you embrace your inner Goth if you choose to dress the part or not. And with DJ’s spinning tunes until late, we think it’s a perfect choice for a night out. Shiny new gig-promoters Rhyme present their very first gig and have thrown together a highly impressive line-up that shows us they really know their stuff when it comes to the North East music scene. Rapidly becoming a household name, Great Waves’ accomplished song-writing skills have long been proven with their debut EP ‘Sequoia’. Groovy indie-pop tunes that draw influences from a multitude of other genres and eras come to life in their performances and are sure to quickly draw you in with catchy choruses and beautiful harmonies. The line-up is completed by another two acts that are headline worthy in their own right: Indie-rockers the Strand have well and truly been upping their game with ever refining live performances while Leeds based Peace Frog return to Newcastle at long last to bring us those summer-grooves to lose your heart to. An absolute scorching treat of a gig! 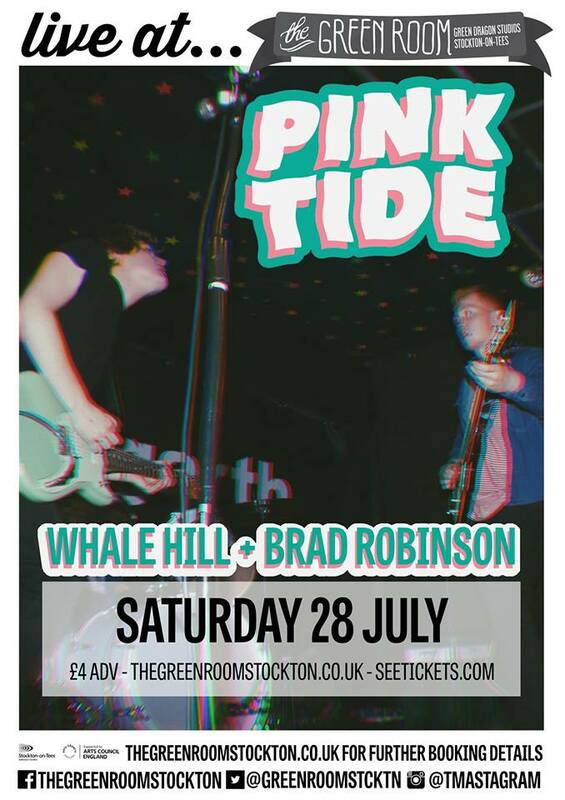 Pink Tide are headlining this showcase of new music at Stockton’s darkly cosy Green Room. Their mix of bluesy vibes and youthful indie-rock gives the Middlesbrough trio a unique edge that is matched by their slick live show and will have audiences up and on their feet, guaranteed. Preceding the night’s main act are newcomers Whale Hill who are already noted for their heavy riffs and energetic, crowd-rallying songs while acoustic act Bradley Robinson will ease you into the night with his powerful vocals and soothing melodies. A fantastic showcase of promising local talent that is sure to make your last Saturday of the month ring out on a musical high.